Acupuncture releases natural painkillers, promotes blood flow, stimulates hormonal balance, relaxes tight muscles, calms anxiety, lifts depression, and promotes digestion. This ancient Chinese therapy effects every major system of the body, including the cardiac, gastrointestinal, circulatory, cerebral, genitourinary, endocrine and immune systems. Some people explain acupuncture in terms of energy and meridians. While this is not wrong, it would be equally right to explain that the energy is based on nerve conduction and proper firing of the nervous system. Each acupuncture point is a small area about 1cm in diameter. They are where groups of nerves meet below a small opening in the fascia. Needling these points, electronically stimulating or even applying vibrational therapy or direct pressure activates the points. This will help dissipate energy that has built up or, alternatively, stimulate the flow of energy to the area. Did you catch that? Needles are only one way to stimulate the point. If you don’t like needles and wish to try a needle free way of stimulating the points, there are alternatives. 3. Brings balance in the body. Usually relief is found after the first 30 minute treatment. It typically takes 4-8 treatments to restore balance and heal the body. Sessions can be daily, biweekly, weekly. For maintenance, once a month. Under Ontario regulation, Naturopathic Doctors are able to perform acupuncture. If claiming under your benefit plan, it will be considered as “naturopathic services”. 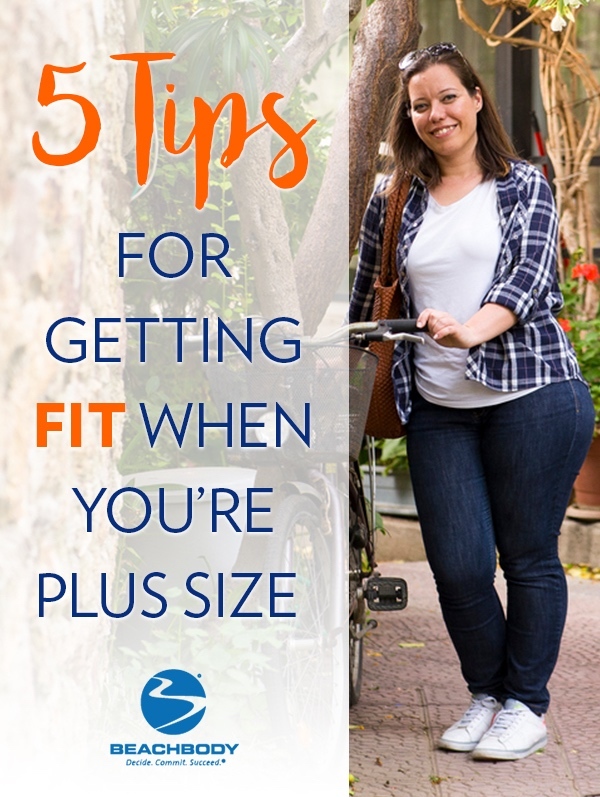 Starting a fitness journey is always a challenge, but it may feel even more daunting when you’re carrying a few extra pounds. If it’s been awhile since the last time you laced up your sneakers, you may not be 100 percent sure what you’re still capable of — which can make it a little intimidating to hit the gym alongside people who look like chiseled bodybuilders and aspiring fitness models. But “fit” comes in many shapes and sizes — and you can always nail fitness goals in your own living room with Beachbody On Demand if the gym isn’t exactly your happy place. Here are a few tips for getting in shape, no matter what your shape is. 1. No workout is off limits. Have you ever seen a workout that looked intriguing, but you were concerned you didn’t have the “right” body type for it yet? Maybe you want to try martial arts, but you’re worried that you lack the mobility, coordination, or power to execute a jab/cross/snap kick combo like a Muay Thai fighter. Or you want to try yoga, but you can barely hold downward dog. 2. Don’t underestimate your fitness abilities. Your weight or BMI (body mass index) can help you determine your starting point, but they’re not the only (or even the best) way to measure fitness. Instead, gauge your progress by how strong and energetic you feel, and when you notice your workouts getting easier, go harder. “A lot of people get really safe about using modifications,” McMatthews says. “They don’t realize how fit they’re getting, and how fast they’re getting stronger.” If you begin to notice that the modifiers aren’t leaving you out of breath and drenched in sweat by the end of a workout, it’s time to move on to the main moves. 3. Get the right workout gear. Splurging on workout gear might feel kind of vain, but it isn’t just about taking awesome sweaty selfies — the right gear can keep you comfortable and even help prevent discomfort and injury. A supportive sports bra can keep everything in place during plyometric (jumping) exercises, for example. Moisture-wicking fabric can prevent chafing between the thighs. 4. Pay attention to your technique. Proper form is always important. Not only does it help you get the most out of the exercise, but it can also help you reduce your risk of injury. “It’s really important to make sure your technique is there — especially if you’re carrying around more weight, because you need to protect your joints,” McMatthews says. Beachbody’s PiYo (part pilates, part yoga) and 3 Week Yoga Retreat are great programs for those wanting to take it easy on their joints since they are both low impact. Whatever program you choose, take it slow when you’re first learning a move, and listen to the form cues from the instructor. “Work on proper alignment and proper technique so you’re avoiding injury — and getting better results, as well,” says McMatthews. It can be tempting to go full-throttle from the get-go, but that can backfire — if you get hurt, you won’t be able to work out for awhile. Don’t let the scale be your only barometer of success — look for other signs that you’re getting stronger and slimmer. Have you lost an inch off your waist? Are you using heavier weights than you were last month? Can you hold a 10 seconds plank longer? Do you see a thinner profile when you look in the mirror? “Focus on non-scale victories, like how you’re feeling during the workouts and if you have more energy during the day,” McMatthews says. That includes emotional victories, too, such as feelings of pride and confidence following a tough workout. The keys to meeting fitness goals are to stay positive and not get discouraged. Stay consistent and be patient — results will come. “After a tough workout, a lot of people feel like a new and improved version of themselves, regardless of how much weight they have lost,” says McMatthews. I often get complaints from clients about being sore. Statements like “I thought exercise was going to make me feel good, but now I feel worse than ever” are somewhat common with people who are new to exercising. And there’s not too much for me to tell them. The fact is that if you have any designs on changing your body for the better, you are going to spend some time being sore, which can be a scary prospect. But, it’s inevitable so you have to get over this fear. Fact: there is some pain associated with the ultimate pleasure of being fit. Also, if you anticipate, plan, and take the proper steps, you can minimize your muscle soreness. I’ll get to this in a sec but, first, let me tell you a little story—a very short one—that might help you out a bit. When I say we all get sore, I mean all. When I originally wrote this, I was very sore. And I got that way by doing one set of lunges. Yes, that’s right, only one set! I wasn’t out of shape. Quite the contrary, I was cycling harder than I had in years and a member of the U.S. National Duathlon Team. So by most people’s definition, I was ultra fit. However, I’d not been doing lunges. I hadn’t done a single one since I finished 10,000 of them over a four-month span the year before. My body wasn’t used to lunges and, whenever you do something physical that you’re not used to, your muscles get sore. What this means is that most of you reading this are going to get sore—maybe really, really sore—somewhere along your road to fitness. But I can help, because I’ve been through every level of soreness possible, from the “ahhh, I’m starting a new program” feeling to the “@#&!, I can’t walk” misery. Here are eight ways to achieve the former statement and avoid the latter and find out if you should work out if you’re sore. Yes, you heard that right–work out! But, take it easy. This is what is called a “recovery workout,” which is aimed at increasing circulation rather than creating micro-tears (or microtrauma) in the muscles, which caused the soreness in the first place. Exercise promotes circulation, which reduces soreness. Sitting around while you’re sore is actually worse regarding relieving your soreness than having an easy working out. What you should do is warm up and then do part of your scheduled workout. Maybe do half, or even just a quarter. Use the extra time after the cool-down to stretch and ice. But, remember, if it’s only your legs that are sore, you don’t have to go easy on your upper body, and vice versa. Nice try. There are generally two types of pain associated with working out: from muscle soreness or from injury. It’s not always clear which is which, so tread lightly until you know the difference. I’ve had quite a few clients over the years who thought they were injured but simply had muscle soreness. There is no absolute way to tell, but if your soreness lessens as you warm-up, there’s a very good chance you’re dealing with just soreness of the muscles. Increasing pain doesn’t necessarily mean you’re injured, but it means you shouldn’t exercise that day. If this pain doesn’t change in a day or two, injury is likely and you should see a professional. Muscle soreness always improves over time. This idea is going to be foreign to many of you but eventually you’ll learn that a little soreness means you’ve embarked on something that is good for you. The first time, however, you’re going to have to show a little faith. Whenever I switch up my training, I go through an initial period of soreness. While it’s always bothersome, especially say, when it hurts to take off my shoes or wash my hair, I know that it’s only temporary and that it’s an important step along the road to my goal. So I embrace it. Sure, it hurts. But it hurts in a good way. A great way even. I love the beginning of a new training cycle because I know that once I work through the pain, I’m going to be fitter than before. In fact, when I haven’t had a period of soreness in a while, I start to feel like a slacker. The more time you can spend doing extra stretching at the end of your workout, the better you’ll recover. Don’t stretch your muscles when cold, as you’ll risk injuring them. An extra 10 minutes after you work out, however, can do wonders. Also, easy movements and stretches right before bed and again first thing in the morning helps your blood circulate better and will also improve your recovery time. Remember that I said I knew I was going to get sore? You will be, too! So go easy on your first day. And I mean E-A-S-Y. It’s normal to get excited on day one. You just ordered Beachbody On Demand and you’ve had visions of yourself walking down the beach turning heads. This is great, but keep your wits about you. You’re not going to get ripped tomorrow or the next day. Hammering through your first workout could end up delaying your program two weeks while you recover from your exuberance. Instead, start slow. Do much less than you feel like you could. You’ll get sore in any case. Next day, push a bit harder. The following day, a bit harder still. Easing into a program is the best way to make steady progress in your fitness. The more you exercise, the better you need to eat. Junk food won’t fuel your muscles properly. This is especially true if you are trying to lose weight since you’re most likely eating less. So what you do eat becomes vital. The better you eat, the less sore you’ll be. Try to exercise on an empty stomach and then after your workout, drink Beachbody Recover or eat a small snack that is approximately four parts carbs to one part protein within an hour of finishing your workout. This will greatly help the recovery process and reduce soreness. You don’t have to go to a masseuse; self-massage is another great tool to aid recovery. The only time you don’t want to massage your muscles is right after you work out because you will interfere with the natural recovery process. But at any other time, such as before heading to sleep, just five minutes of self-massage can help circulation immensely. More on the circulation theme—nothing moves blood around like ice. It causes blood vessels to contract at first, and then open as you get used to it. If you’ve ever watched a locker room interview after a sporting event, you probably noticed a lot of the athletes were icing parts of their body. That’s because it’s one of the greatest recovery aids we have available. Almost all injuries heal quicker if you apply ice. Working out causes micro-tears in the muscles, which are necessary in order to get stronger but cause the pain of soreness. These micro-tears heal faster if you ice them. You can ice any sore body part up to 20 minutes at a time, a few times throughout the day. It’s hard at first, but you get used to it the more you do it. Start your day right. It takes only 5 minutes to whip up this dairy free, gluten free breakfast cake. It is a good source of fibre and protein and has no added sugar. Microwave for about 3min (depends on the strength of your microwave). It is done if the centre bounces back when you touch it. If it is not bouncy in the middle, put it back in for 30 more seconds and test. For more Paleo mug cake recipes here. If you live in Canada and don’t supplement, you are likely deficient in vitamin D. How much to supplement and for how long is very individual. It is based on things like the natural colour of the skin, immune status, food intake and time spent outdoors in the summer. The body makes vitamin D when the skin is exposed to sunshine or ultraviolet light. About 20 min of unprotected exposure mid day in the summer months in Ontario will produce about 1000IU of vitamin D.
Small amounts of vitamin D may be found in food sources such as fish, egg yolk, beef liver, however, when sunlight is inadequate (no exposure or seasonal variance), supplementation is essential. Vitamin D deficiency can be suspect in multiple sclerosis, cancer, pancreatic deficiency, Crohn’s, Colitis, fibromyalgia, chronic fatigue, chronic low back pain, or severe muscle weakness. Vitamin D levels have an optimum range, with increased risks for health disease when deficient or in excess. OHIP no longer pays for vitamin D testing mostly because they found everyone to be deficient and suggest we all should supplement, at least through October to March. How much to supplement depends on the individual. Recent research shows that people supplementing may have overdone it and now there are risks showing up for people who are taking vitamin D in excess. Protect from overdose by getting enough vitamin A (liver, organ meats, cod liver oil) and K2 (brie cheese!) in the diet. Sometimes if levels are high enough, it means lowering the dose or stopping supplementation for a while. Levels are best monitored by a blood test, then with the advice of your doctor you can be sure you are taking the amount that is right for you. You may pay (about $45) for a basic vitamin D blood test with your Naturopathic Doctor. You may book your appointment (fees in addition to the blood test) today to investigate further.